Cover date: January 1985. 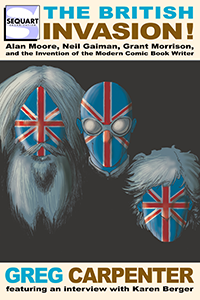 Writer: Alan Moore. Artist: Shawn McManus. Colorist: Tatjana Wood. Letterer: John Costanza. Editor: Karen Berger. This issue is something of a departure for the series. 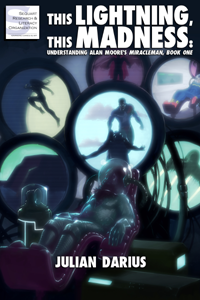 Shawn McManus illustrates Moore’s tale of Pog, an alien who, with his companions, is searching the galaxy for an unspoilt planet upon which to settle. They find Earth and, despite their initial jubilation and excitement, Swamp Thing reveals to them that earth is not the untouched paradise that they had first hoped for. McManus’ fill-in issue no doubt gave the regular art team enough time to produce the annual and the seminal #34. Delays had also begun to affect the book, with Bissette’s self-confessed relative slowness being a prime factor. This even led to a reprint issue, albeit one with an intriguing framing narrative, which will be explored in the discussion of the next issue (#33). The character of Pog is based on Pogo, created by Walt Kelly, and the issue is partly an affectionate homage to Kelly’s work. Pogo was a satirical newspaper strip, and its concern with environmental issues is shared with Moore’s Swamp Thing, with both series being set in a swamp. McManus creates a look for the story which is inspired by Kelly’s character designs, while Moore focuses on the environmental subtext of Kelly’s work. Moore also creates a new language for Pogo and his crew. His love of language, shown in his prose captions and realistic dialogue in the previous issues, takes an experimental turn here: portmanteau words, in which two words are combined together as one, are a feature of this issue. This can be viewed as a natural extension of previous experiments, from the poetry evident in ‘A Cautionary Fable’ (a short Future Shock story from 2000 AD) to the futuristic language employed in Halo Jones (also from 2000 AD). He avoids the easiest option for readers: indicating an alien language that is translated into English, usually by including an asterisk pointing to a comment such as ‘translated into English’. Here, however, Moore’s hybrid language is confusing initially, but it can be understood with concentrated effort. 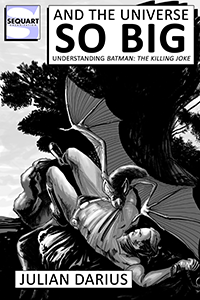 The experimentation with verbal language is juxtaposed with the use of visual imagery: pictures are drawn in the soil as a means to further communication, and perhaps this is a metaphor for the primacy of comics being an effective fusion of words and images as an effective means of communication. Moore also returns to the environmental concerns that marked his earlier issues. It is clear that Pog and his fellow travellers originate from a planet that has been choked and spoilt by environmental abuse. However, their initial joy at finding Earth is destroyed when they witness humans gorging themselves at a fast food stand. This scene is a microcosmic representation of humankind’s greed and how it attempts to dominate the natural world, much like the incongruous presence of a food outlet in the swamp. The unsuitability of our planet for these visitors is further underscored in the most brutal way when one of Pog’s companions is brutally killed by an alligator. The innocent alien, himself alligator-like in appearance, is savaged by a creature he perceives to be related to him, which further emphasizes the tragic disparity between the aliens’ initial expectations of Earth and the stark realities they have since encountered. The only dim hope at the end of the issue lies in the possibility that they can find their salvation on another planet. It is a depressing moment to end on, and indicative of the task facing Swamp Thing, and humanity as a whole, in looking after our home planet. The concept of the ‘fill-in’ issue has been largely relegated to mainstream comics history. Such issues would be produced when a book’s regular creative team were behind schedule and in danger of missing a print deadline. There was no recourse to the types of delaying strategies that are employed today. Simply put, a delay meant loss of earnings, and so reprint issues would bridge the delay gap. Bissette has confessed to finding the schedule on Swamp Thing difficult to manage and such a delay was affecting the publication of the next issue, so a reprint issue was called for. The issue chosen was the eight-page Swamp Thing story from House of Secrets #92 (June-July, 1971). Moore saw an opportunity to create a framing narrative that added extra original material to flesh out the issue, as well as serving to bring the story into DC continuity more firmly. The story was something of a curate’s egg in terms of its place within Swamp Thing publications, as it became out of continuity once the character was revised and place into a contemporary setting. Moore’s elegant solution was to put forward the notion that the current Swamp Thing was merely the latest incarnation of an elemental champion that nature creates in times of great trouble. 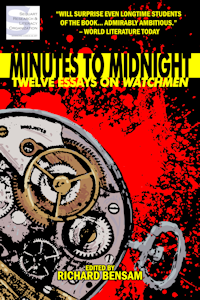 The use of the original short story is reflected in the cover to this issue. Created by series inker John Totleben, it’s a direct homage to the cover of House of Secrets #92, and here we see Abby sat at the dressing table, brushing her hair while the Swamp Thing looms in the background near the open window. Abby is the focal character in Moore’s framing narrative, which consists of a dream sequence in which she encounters two characters from DC Horror comics’ past: Cain and Abel, the hosts of House of Mystery and House of Secrets respectively, two anthology comics produced by the company. Abby is given a choice between a mystery or a secret: due to Abel being the more congenial brother she chooses a secret. These remarks act as a little metafictional commentary, alluding to the fact that Cain and Abel have not appeared in any stories since the cancellation of their anthology titles. Interestingly, they would play a significant role in another comic a few years later, Neil Gaiman’s Sandman, a series that shares the central theme of this issue: the importance of stories. Abel’s reference to a circular story, represented by a bracelet, allows Moore to draw the original story into continuity: like Alex Olsen, Alec Holland engendered the creation of a ‘Swamp Thing’ and, in turn, establishes that both are only two in a long line of similar creatures. It’s an interesting premise, and serves as a further revision of the character by Moore. In this, he takes what is essentially a reprint/fill-in issue and moves it towards being a valid addition to his run of stories on the series. I remember first reading “Pog” and knowing it was an homage but not being familiar with Walk Kelly’s Pogo. This led me to discover that strip, for which I’ll always be thankful. I’d forgotten the old ‘fill-in’ issues. Sometimes they were phenomenal. The one that leaps to mind is the late Steve Gerber’s ‘Howard the Duck’ #17 (or thereabouts), which was, in effect, a reflective essay accompanied by pictures. I’ve a vague memory that writers were paid by the word at Marvel during that period, which – if it was the case – only illuminates Gerber’s 1970′s brilliance further.